South Shore Bail Bonds Provides bail bonds services to all inmates detained in the South Lake Tahoe Jail. If you or a loved one needs bail bonds services in the South Lake Tahoe Area, Be sure to contact South Shore Bail Bonds for Professional, Prompt, and Descreat Service. 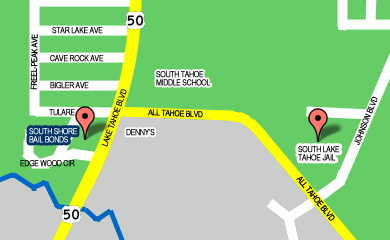 Our Lake Tahoe Bail Agents are ready to help you or your loved ones 24 hours a day, 7 days a week. I have been involved in the bail bond industry for close to 20 years. I take pride in my bail bonds business and enjoy being able to help families release their friends and loved ones from the Lake Tahoe jail after being arrested. The bail process isn't something that everyone's been through. My job is to explain the process and how it works and to execute it as professionally, quickly and efficiently as possible to ease my client's stress. Supporting the Future of Shooting Sports in El Dorado County.